American music website Billboard.com launched a new K-pop column called “K-town” on Tuesday, in a move to bring K-pop news, songs and music videos to its readers each week. The column will also feature exclusive content including interviews, photos and videos, according to Jeff Benjamin, a Billboard Korea staff member. 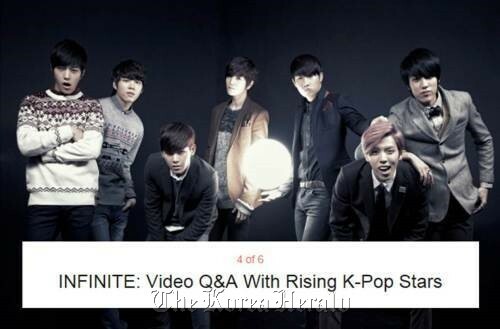 The first K-pop act to be featured in the “K-town” column was INFINITE under the title, “Infinite Video Q&A with the Rising K-Pop Superstars.” Earlier this year, INIFINITE’s “The Chaser” was named the 2012 K-pop Song of the Year by Billboard Magazine. Billboard introduced the boy group saying, “INFINITE’s popularity is growing massively in both Korea and Japan, but their megastar status did not come overnight. The group’s 2012 debut effort ‘Come Back Again’ was met with lukewarm response and they remained relatively unknown until the release of their second EP,” the article noted. The Billboard article went on to discuss INFINITE’s most memorable performances of last year, and revealed a video interview with the group, in which INFINITE members sit down to discuss the success of “The Chaser,” their performances of 2012, their fan club INSPIRIT, and future plans. In the interview the members recalled their excitement upon hearing that their title track “The Chaser” became Billboard’s 2012 K-pop Song of the Year. “We were more surprised because we’ve never been to the U.S. and never sang an English-language song,” a member said. The members also mentioned that one of the best qualities of “The Chaser” was its lack of English lyrics. Meanwhile, the group’s leader Sung-gyu released his first solo album, “Another Me,” in November 2012 and Dongwoo and Hoya created a sub-unit group, INFINITE-H, and released their album “Fly High” on Jan. 10. Their first single “Special Girl” is currently at No. 8 on the K-pop Hot 100 at Billboard.com.